On Wings of Eagles: How Many Signs Do We Need? How Many Signs Do We Need? "How can they do that?" asked one of the boys at the orphanage. Five or six boys had captured several lighting bugs in a jar. They sat outside one Saturday evening watching them as they, one at a time, lit up their magical bodies. "It's like a special nature thing." said one of the boys. "We can give them food and water and they will live for a long time. Won't they?" One of the boys asked. "We can't keep them locked up in a jar. The church lady says that it's wrong to kill anything that God made for the world. It's wrong to kill things." said Tommy. "If God didn't want us to have them then he wouldn't let us catch them. After all their just bug things." said Wayne. "If God wants us to let them go then he could give us a special sign." said Tommy. All at once the small bugs stopped lighting up. The jar now sat on the ground with the boys waiting to see if they would once again start to light. "Maybe their dead now." One said. "They’re not dead. That is a sign from God to let them all go." said little Billy Smith. "That ain't no sign." said one of the boys. "If God wants us to let them go then he should make them blink just one time. Then we'll know it is a sign." said Wayne. Everyone fell totally silent and all eyes were glued upon the glass jar with anticipation. 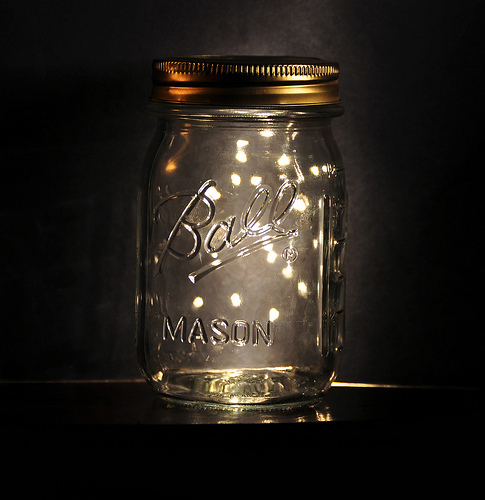 All of a sudden there was one small flash of light and then the jar fell dark once again. "That was just an accident." said Wayne. "That ain't no accident. You better let them go or you’re breaking a promise to God." said Billy. "We'll do it one more time. This time they have to blink two lights. Then we'll know it's really a sign." said Wayne. Once again they sat in a circle around the jar, silently waiting for the sign. "Holly Mackerel." said one the boys as two lights appeared in the small jar. Slowly one of the boys reached over and unscrewed the lid to the jar. We boys sat there silently, with their eyes as big as saucers. Several minutes passed before they decided to thump on the jar causing the lighting bugs to fly away. How often are we like the little boys, asking for just one more sign from God. Let make today the day that we completely trust God and not keep asking for more signs. Dear Lord, we pray that today we would look to You for the answers and that we would take You at Your world and not keep asking for more signs. In Jesus’ Name, Amen. How Strong Are Your Habits? Habit is Overcome By Habit. The Stress Kit or God's Forgiveness? The Odds Are in God's Hands. Will You Be an Angel Unaware? Do You Have Too Many Engineers? The Fan and Listening to God's Voice. God is in Control of Everything. Biblical Lessons from a Nurse's Lessons. The Lost Daughter and Prayer. God Will Show the Way if Our Eyes Are Open. Samuel Morse - "What hath God wrought!" You Ready to Score a Touchdown? Our Life is a Trail. Are You On God's Super Bowl Team? God Will Bring the Right One at The Right Time.